attilaseboshop offers conductive rubber products, keypad repair kit and rare, obsolete parts for home audio appliances, electronic music instruments, industrial appliances and cameras. We have some rare audio mechanical parts for tape deck or reel to reel tape recorders. We offer conductive rubber pads in various diameter and parameters in KIT. 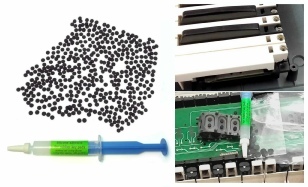 Our popular conductive rubber products are designed for MIDI keyboards and controllers. We also offer conductive rubber pads for remote controllers and flexible keypads. We manufacture conductive pads in KIT for game controller fix also. Our new product is a paper thin conductive rubber pad for various purposes. You can fix the damaged conductive surface of flexible keypads with paper thin replacement conductive pads. It is not necessary to cut off the original pad. This new product is available soon. Custom KIT may be available also, upon request, if you need different or unique pads. For availability and more details contact us please. Attilaseboshop conductive pads and keypad repair KIT can be used for most of general flexible silicone keypads in IR remote controllers, various game controllers. With our repair KIT specially designed for MIDI controllers, damaged synthesizer flexible rubber strip also can be repaired. The ASK03M, ASEBOKIT3M400, ASEBOKIT6M3-200 KIT versions are good for most of conventional or vintage synthesizer / organ / controller keyboards. Audio cables: we are manufacturing different audio cables also, for unique purposes. Currently we offer headphone conversion cable with dice DIN plug for vintage appliances. Secure shopping, fast checkout and secure payment is available.